All Milford Residents Invited to Help Us Make a Clean Sweep of Our Community! Watch Our Quick VIDEO INVITATION! Citizens for Milford is organizing its Fifth Annual Milford Beautification Day, Milford’s annual clean-up event, which enables area residents, organizations, and businesses to work together to beautify our community by picking up trash around town. 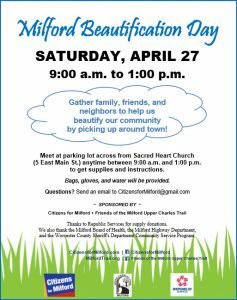 Milford Beautification Day will be held Saturday, April 27th (rain or shine) from 9:00 a.m. to 1:00 p.m. All interested citizens are invited to meet with organizers anytime between those hours in the municipal parking lot across from Sacred Heart Church (5 East Main Street) to get supplies, instructions, and assignments. Event co-sponsor Friends of the Milford Upper Charles Trail will be expanding their Beautification Day efforts this year. In addition to organizing the clean-up of the Trail, they will also be working with interested families to help plant a flower garden near the Trail entry at Louisa Lake. Trash bags, gloves, and water will be provided to all clean-up volunteers. Top soil, mulch, and plants will be provided to the volunteers who work on the garden project. The clean-up supplies are being donated by Republic Services, and the Friends of the Milford Upper Charles Trail are donating the planting materials. In conjunction with the efforts being organized for Beautification Day, Citizens for Milford has also arranged for volunteers from the Worcester County Sheriff’s Department Community Service Program to initiate the Beautification Day work by conducting a clean-up of main streets around town on April 25 and 26. Questions regarding any of the Beautification Day efforts may be submitted by email to CitizensforMilford@gmail.com. The two event sponsors are sincerely grateful for the assistance and donations provided by the Milford Board of Health, the Milford Highway Department, Republic Services, and the Worcester County Sheriff’s Department Community Service Program. Friends of the Milford Upper Charles Trail is a 501(c)(3) non-profit volunteer organization formed in 2005 to benefit the Town of Milford and surrounding areas, working diligently and in cooperation with the Town of Milford Parks and other departments, various community groups, and interested parties to educate area residents about the recreation and transportation opportunities offered by the Milford section of the trail; promote the use, development, enjoyment, and care of the Milford section of the trail; and raise and expend funds to support trail maintenance and improvements for the benefit of the residents of the Milford area. Information is available on the organization’s website (MilfordTrail.org) and Facebook page (Facebook.com/Friends-of-the-Milford-Upper-Charles-Trail).